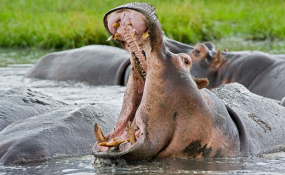 Southern Region Water Board (SRWB) is now testing Shire River water at Liwonde to find if it is contaminated with anthrax which has killed 28 hippopotamuses so far. SRWB spokesperson Rita Makwangwala has confirmed that the board is testing the water at Liwonde in order to find out the extent of the contamination. "But our consumers should be assured that the water is safe. We are ensuring that the water is safe for drinking as we are doing the tests," she said. An official at Balaka District Hospital Katenga Kaunda said the anthrax contamination of the water at Liwonde was a health risk. "There is need to get the water tested for anthrax in an independent laboratory," said Kaunda. This follows tests conducted at the Central Veterinary Laboratory, instituted by Ministry of Health (MoH) , whose results indicated that there was Bacillus Anthracis in the hippos' system, a virus that causes anthrax. The World health Organisation (WHO) describes anthrax as a disease of herbivorous animals that causes severe infection in humans as a result of contact with contaminated products or animals. The hippos have been dying in the upper side of the Shire River all the way to Liwonde Barrage. They started dying mid-September but the first carcasses were seen floating on October 10. According to WHO, anthrax is transmitted to people who come in contact with infected animals or contaminated animal products and contact with anthrax can cause severe illness in both humans and animals.